As 2014 came to a close, and New Year Resolutions were in the forefront of my thoughts, I decided to take a look at what things made me unhappy in 2014 and modify as many of those things as I could. Of course, that would require me to quit my job, hire a maid, hire a chef, and buy a beach house in Key West. A bit unrealistic. Then I decided to take a stab at something else we all do every single day, several times a day, and probably have for years. I would even go as far to bet that you probably have had the same unhappiness as I have with this thing we all do- that is if you own a cell phone or send emails! 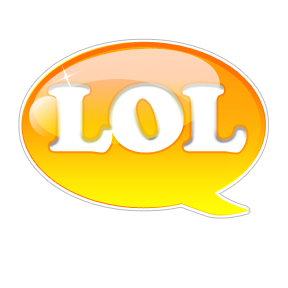 The use of LOL, HAHA, BAHAHA, even SMH, or IMO/IMHO and whatever else you may use to show amusement or to express an emotion in a text message. I have felt my LOLs have been empty lately. Like I was faking my Laugh Out Loud- LOL acronym. Once I identified my dissatisfaction in my level of Emotion, I formed a plan to change things in 2015. Prepare to be Emotional or Not so Emotional—it’s up to you! I propose that at the end of our LOLs, Haha, Hehehe, SMH, or IMO we use a rate system. Let us all unite and start assigning A LEVEL OF AMUSEMENT or LEVEL OF EMOTION #number after our chosen acronym, perhaps a 0-10 rating system. The amusement park Six Flags utilizes a rate system– 6 Flags of fun. Even when you call and take a survey on the back of a Taco Bell receipt you are asked to rate your level of satisfaction. Take the Acronym that you are going to use. I am sure there are ones out there that I have not mentioned and some I choose not to use in this article. It will work with all of them. Rate Example LOL 0-10 0 being a low grade of emotion and 10 being a high grade. Dude’s text: I’m running late. I can’t find my shoes! Mom’s text: I forgot to give you lunch money! Sorry! To make sure the word gets out about the EMOTION RATE Please copy and paste the address bar into your Facebook status! #OLDSCHOOL Oops! I forgot to address stupid hashtags! LOL5! Wait… If I’m going with the 5 star rating system and you are using the 10, will that cause confusion/feelings of inadequacy?